The Rest of the Food – Page 2 – The Home of My "Big Things"
At some point during a prolonged car trip, like this one through eastern Wisconsin, there comes a point – well you know the rest. Going after this Big Silo was one of those points. All this for a pretty lousy Big Thing shot. On top of that Meyer’s Market was equally disappointing. The Oscar Mayer car was there, of course. And Mr. Mustard as well. I can’t begin to tell you how much unexpected fun this experience was. They even had a car show, of course all the cars were painted mustard yellow. Are you ready for a good pun. 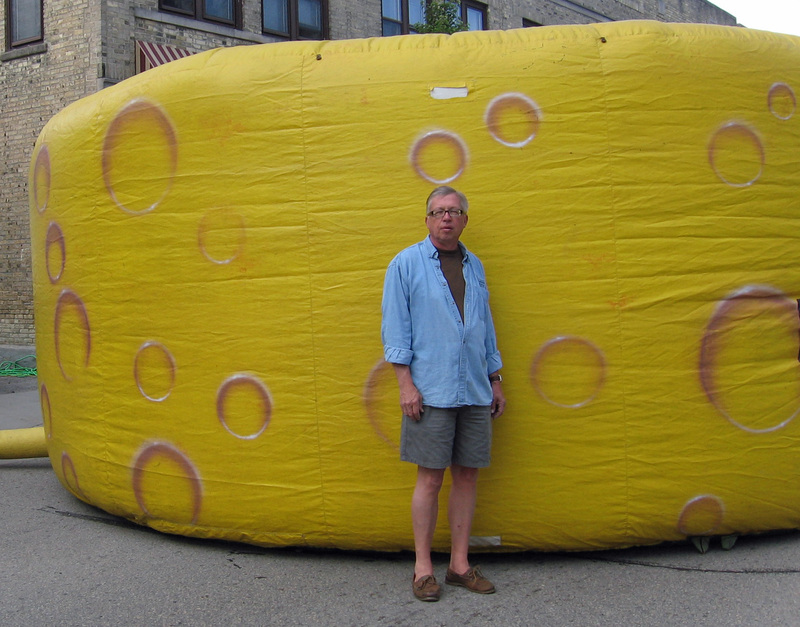 This cheese photo makes for a pretty “cheesey” photo. Get it? Not much to get anyway was there? Southbound from the Wisconsin Dells we were cruising down US-12 to get a Muffler Man in Baraboo. 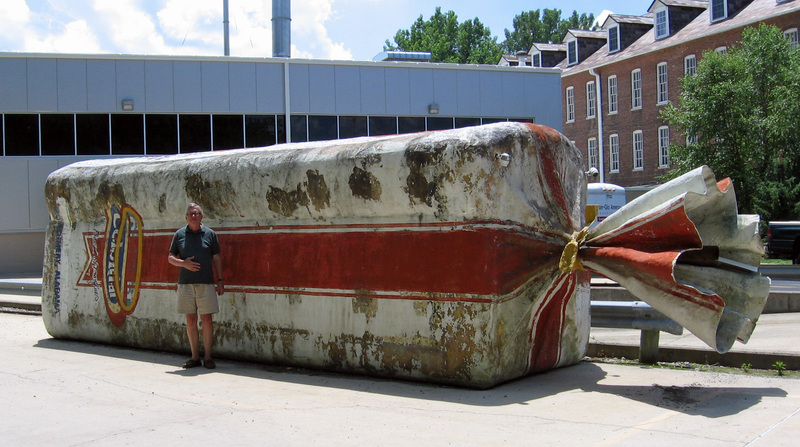 We never did find the Muffler Man – turns out it was laying in pieces behind a wall. 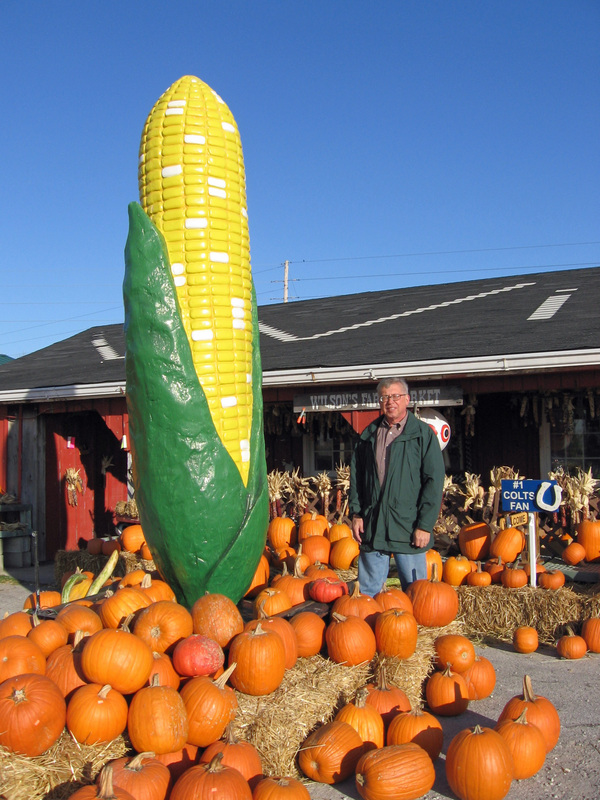 Anyway, we spotted the Big Corn in front of Mark’s Market. Did a quick u-turn and pulled into the open air market. After introducing ourselves Mark invited us to take all the photos we wanted. 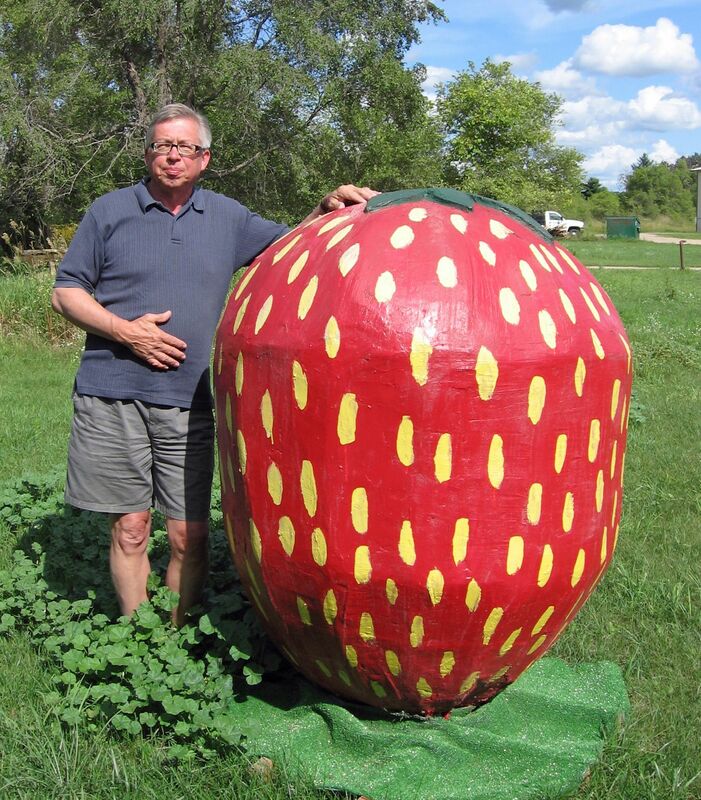 That’s when we noticed the Big Strawberry. Not quite as large as the one in Indiana but good size all the same. They also gave us the tip on the Big Bed which can be found on the Big Objects page. Would you like some fries with your hot dog? 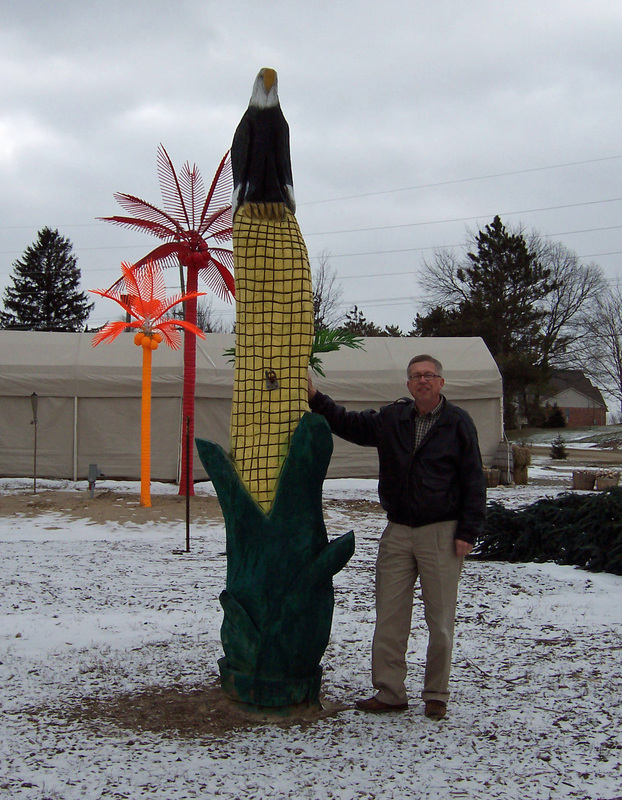 This group of 4 images were part of the jackpot at Mel Schettl Sales outside Oshkosh, Wisconsin. My, how many big things. It was nearly overwhelming for Big Thingologists like Deb and me. We left feeling battle fatigue. I didn’t even get a image of the Jolly Green Giant you see in the background. After leaving Mel’s I had a taste for pizza. Vegetarian by the way. Where does your favorite pizza come from? I grew up in Detroit, down the street from Shields Bar which later became famous for the deep dish type pizza. My good friend Frank Parachetti was one of the pizza makers at Buddy’s which had the same style. Buddy’s bar was an old style Italian bar with a bocci court on the side of the building. 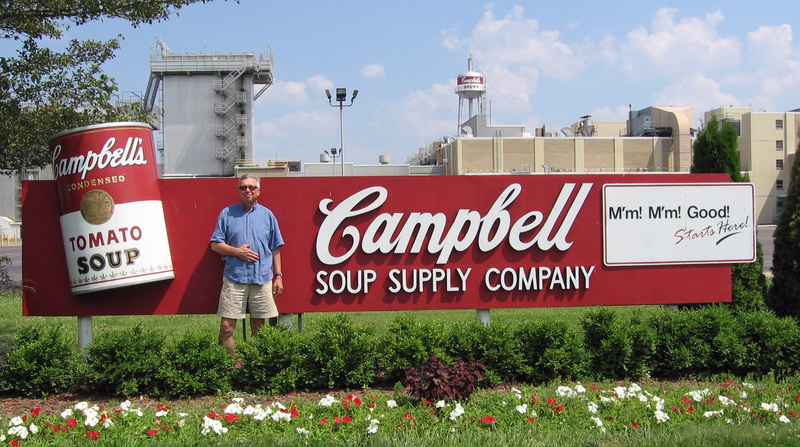 I was searching for a Big Campbell’s Soup Can alongside the Maumee River outside Napoleon, Ohio. 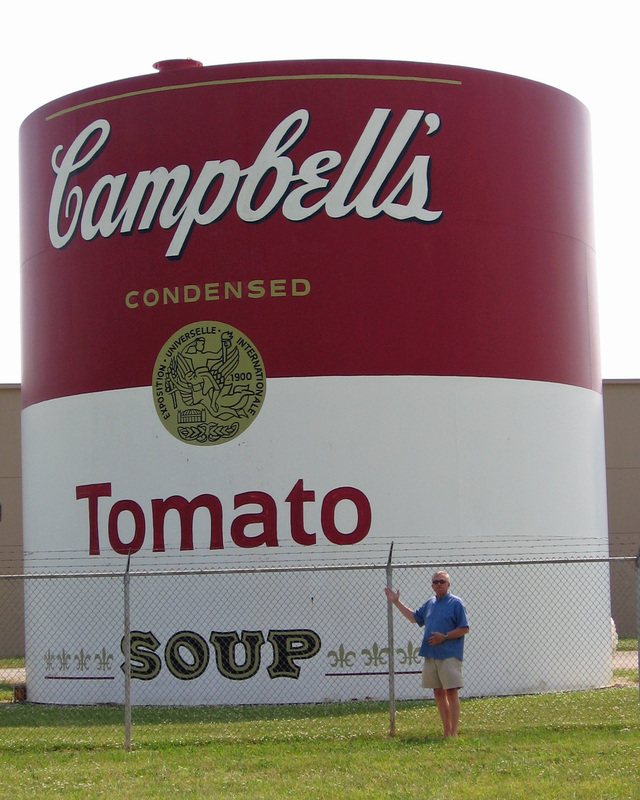 We spotted the can seen here on the left and thought, “Hm, not so big, but still bigger than life.” So we went to get the image. The gate to the parking lot next to the guard’s station was open. so we drove through without stopping. Using a little hustle we got this image and were returning to the car when the security officer arrived and informed us that just because the gate was up, we couldn’t simply drive through. After explaining the Mission, he said we were looking for the water tower just past the building. This is the image seen on the right. 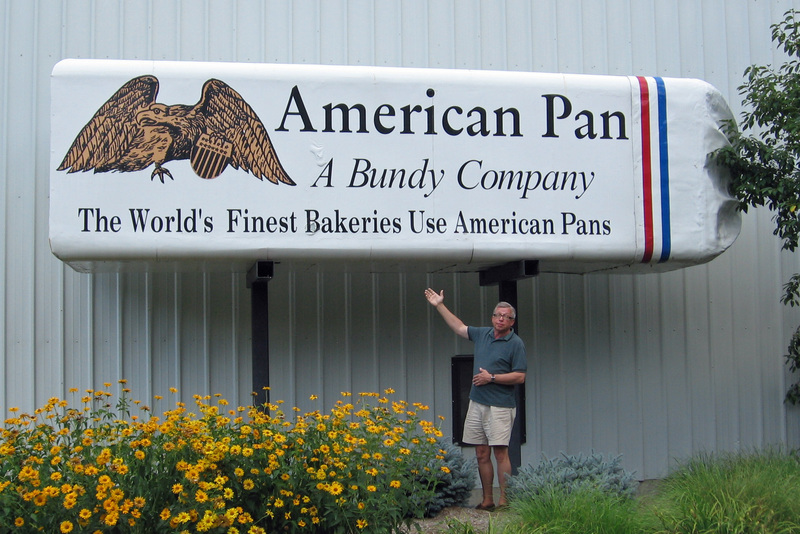 These Big Loaves in Urbana, Ohio (in Champaign county by the way) were a kind of disappointment. The image seen on the left is near the entrance to the American Pan company and is in pretty good shape. The image seen on the right is in the rear of the building and is not really out for public consumption. Urbana was a great find, nice downtown and home to Urbana University. There was supposed to be a Johnny Appleseed Museum but we couldn’t find it. We did find the Mumford’s Potato Chip store on north Main Street and bought two 2 pound boxes of kettle chips, yum. Stop in if you are passing through. 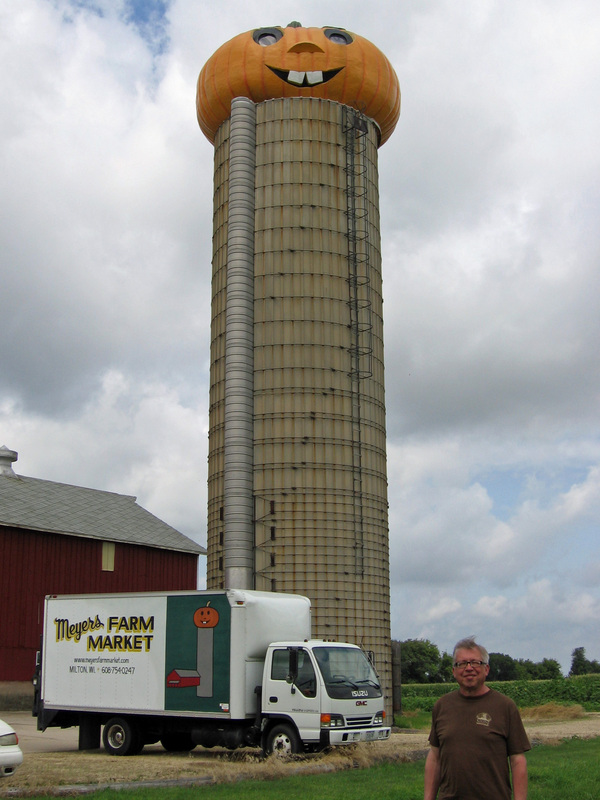 On the way to the Indiana Dunes during Fall Break we took a side trip to Toto, Indiana to get a photo of a Big Guy. Along US-31 we spotted this large ear of corn outside Rusty’s Farm Market on the side of the road. This was just before Halloween as you can probably guess. 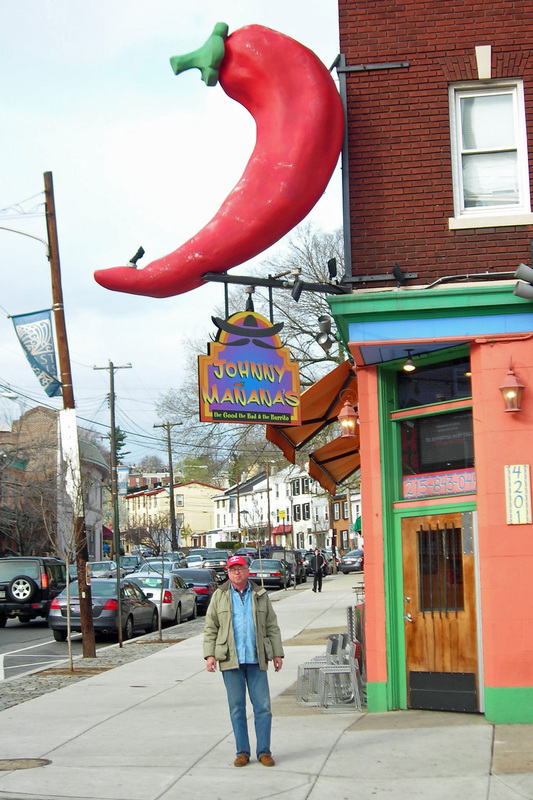 Here is a Big Pepper that we spotted in the East Falls section of Philadelphia. It’s near the East River Drive and Ridge Avenue. I don’t recall what we were doing around here but it’s always nice to get something new. I just filled up the Big Thingsmobile (See the Kissmobile and Oscar Meyer Mobile below) and was going into Sam’s when out in the parking lot was a NASCAR showcar. 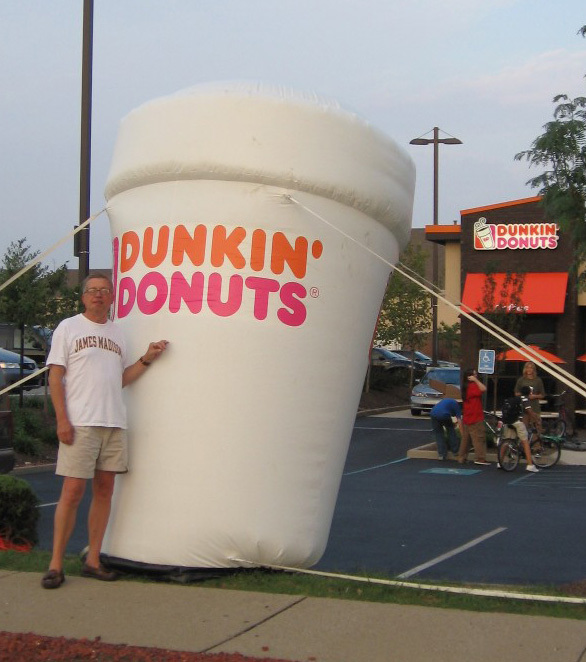 It was the weekend of the Brickyard after all and the town was celebrating NASCAR. 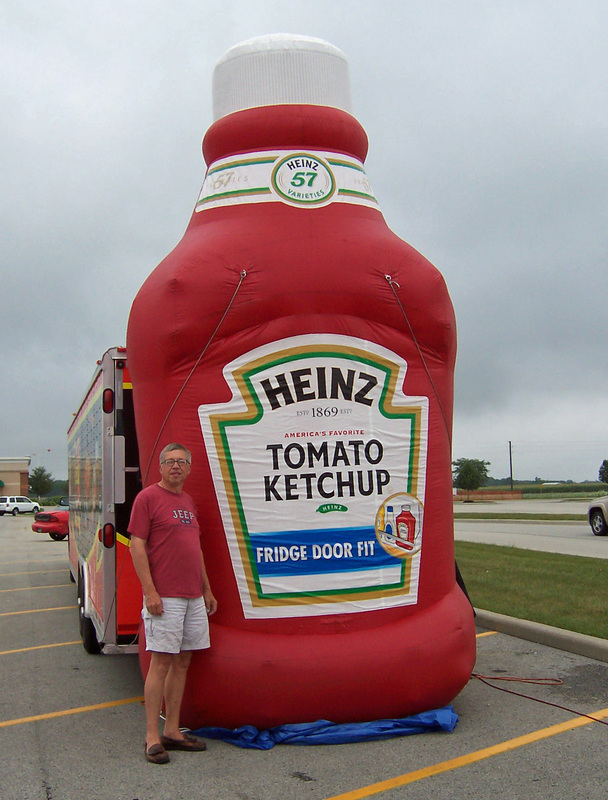 One of this car’s sponsor was Heinz and there was this inflatable Heinz squeezable bottle. Since Deb was out of town I was on my own to get a photo. Fortunately Ann Wilson was working the exhibit with her husband. She was most gracious and took this photo for me. We are at a Dan Ryan’s restaurant in Hong Kong for a taste of an American style grill. Lo and behold, there hanging from the ceiling was this Big Tums. Greg, of course, had his camera and I grabbed an extra chair to stand on trying to elevate my game so to speak. We were driving down US-13 in Delaware on the way to the Eastern Shore on Maryland. 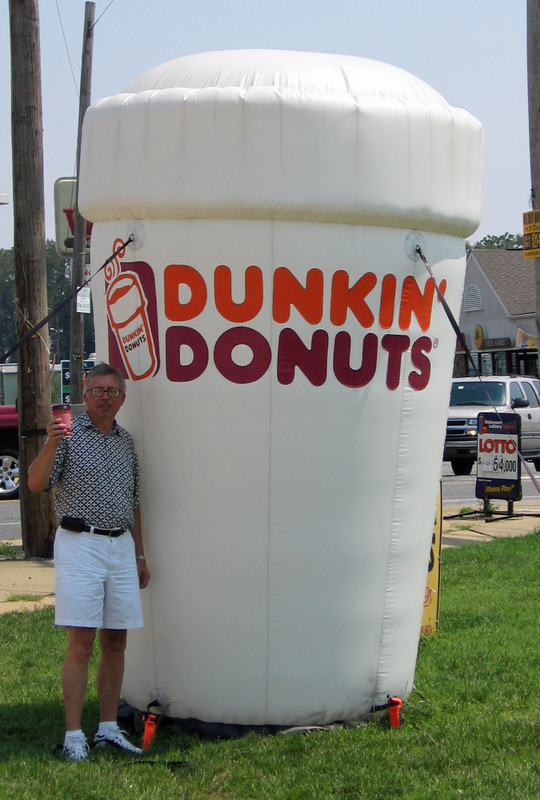 Always on the lookout for Big Things Deb spotted this big Dunkin’ Donuts cup at a BP station. We had to go to the next exit before we could reverse direction to get this image. This image is a little closer to home than Hong Kong, etc. 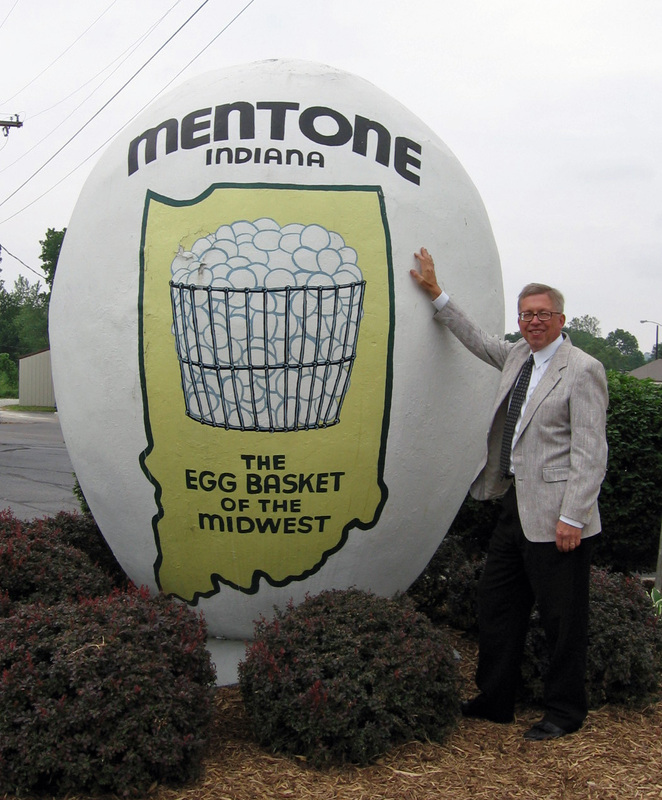 It’s in Mentone, Indiana, “The Egg Basket of the Midwest.” Steve and I were driving from Grand Rapids and picked this up on the way back. I had this beauty in my Big Things to Photograph file for years but never had a chance to get to Mentone. And what do you know, we arrived as the town was getting ready for their Egg Festival! Main street was blocked off and booths were being set up. We didn’t stay around but I bet you could get a nice Pork Tenderloin or Elephant Ear there. Oh, I had a bunch of fun at a Walmart Grand Opening in Arkansas. Some suppliers brought out their inflatables. 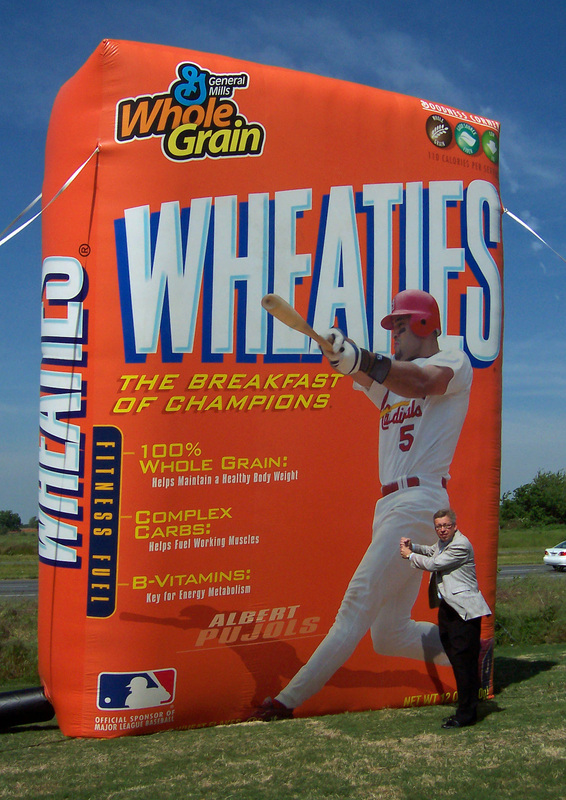 Here’s one from Wheaties. 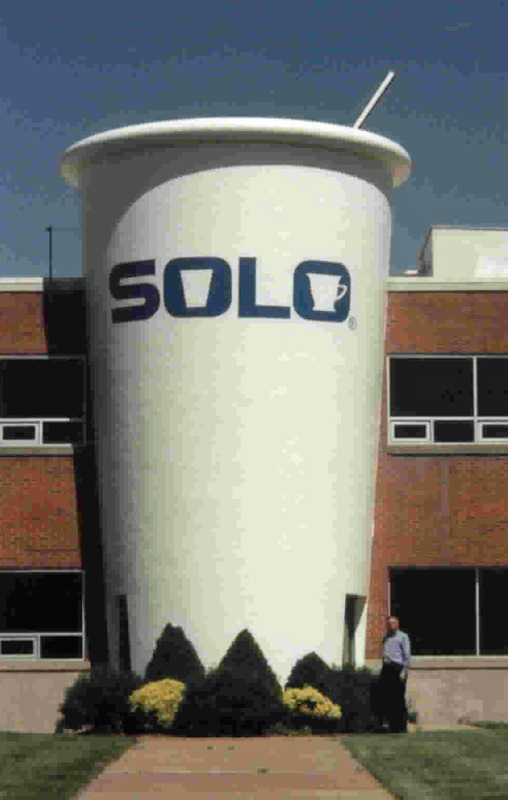 In Springfield, Missouri is this office building for Solo products. It looked pretty deserted and the parking lot in front was empty so I guess it has seen better days. 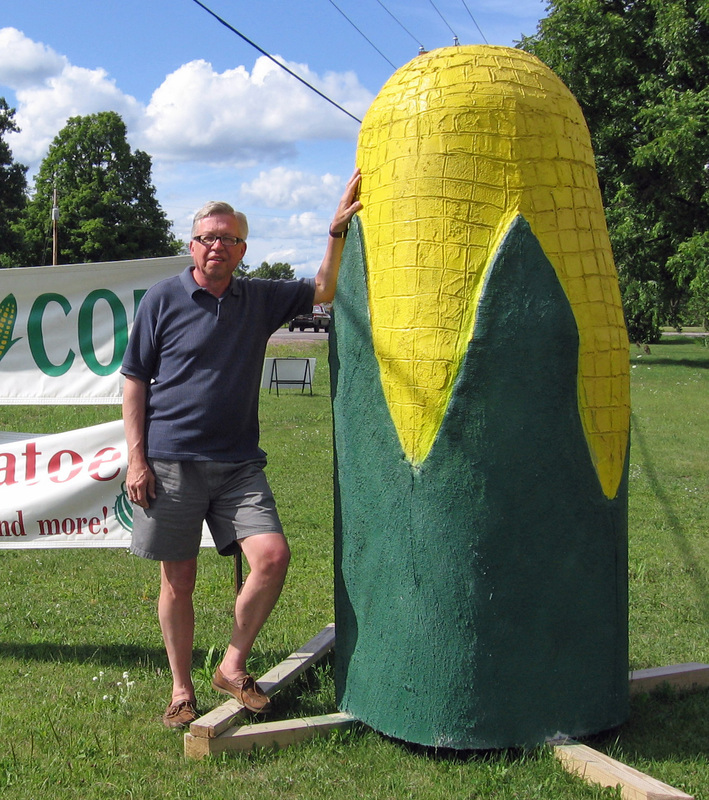 Got this corn carved from a tree trunk on M-59 in Michigan between US-23 and Pontiac. I don’t remember exactly where it was. Check out the palm trees in the background. I picked up this site from Roadside America. We were coming down from Prudenville, MI and were passing close by and decided to visit this site. 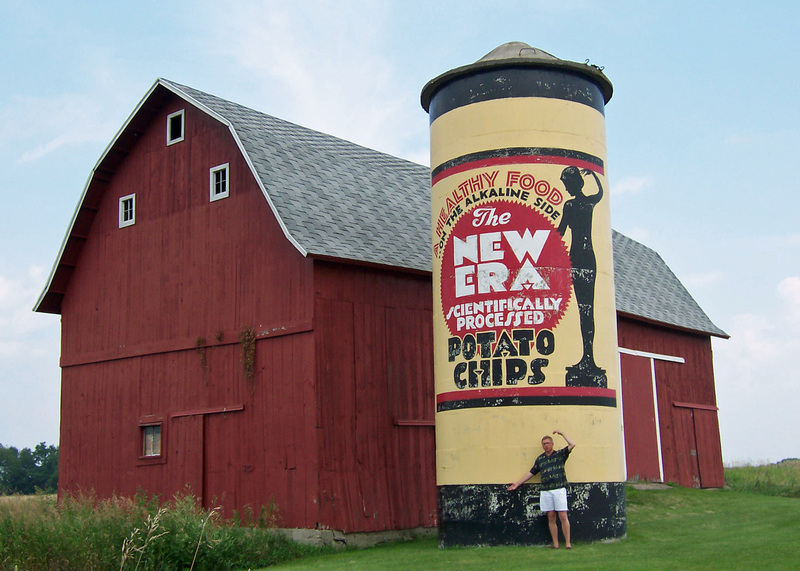 Out in the middle of Michigan farmland is this great silo painted like the New Era chip cans I remember. I don’t know who keeps this up, but kodo’s to them. Before Alex’s sighting we made it to the Traverse City Cherry Pie. There seems to be some dispute about this pie and the Charlevoix Pie regarding size. I don’t care since both are pretty big. 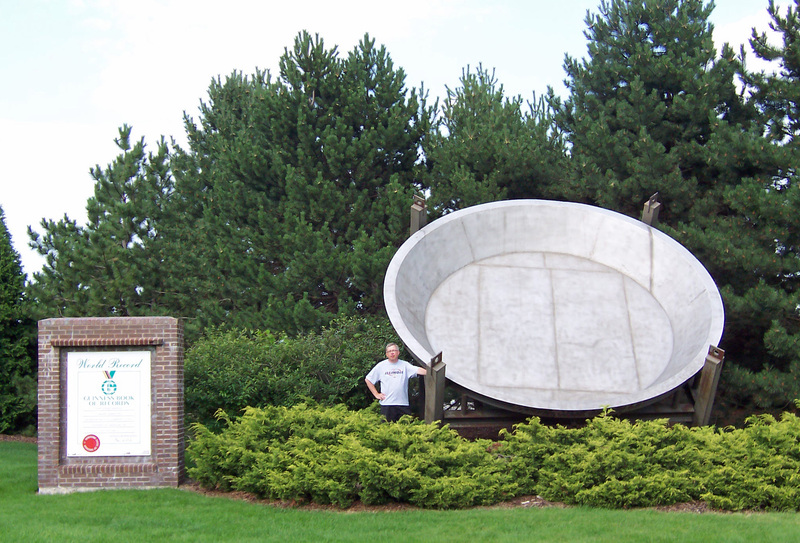 This pie tin just south of Traverse city has a plaque from the Guinness Book of World Records. 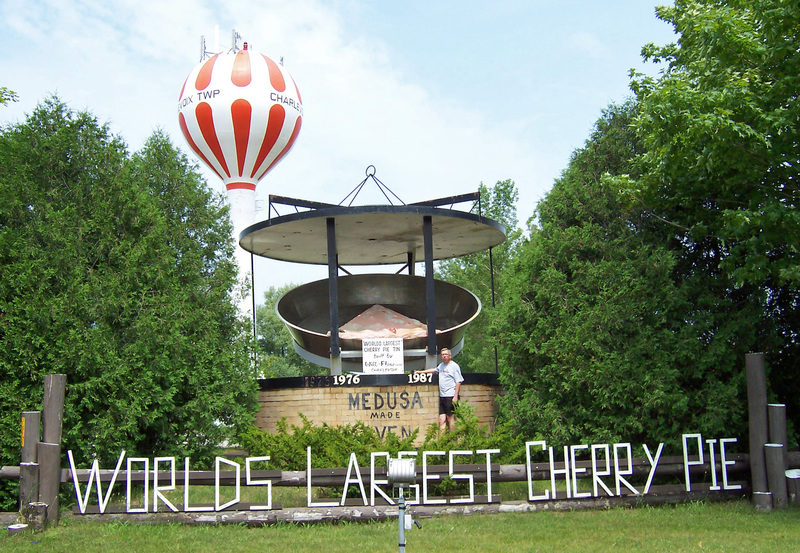 No doubt, the Charlevoix Cherry Pie is BIG as well. Located just south of Charlevoix in front of of Fire Dept Station #2 at 6591 S. US-31 (look for the red and white water tower) this pie rivals the Traverse City Cherry Pie. I’ll leave it up to more exacting people. I just know both are BIG and both are cool. 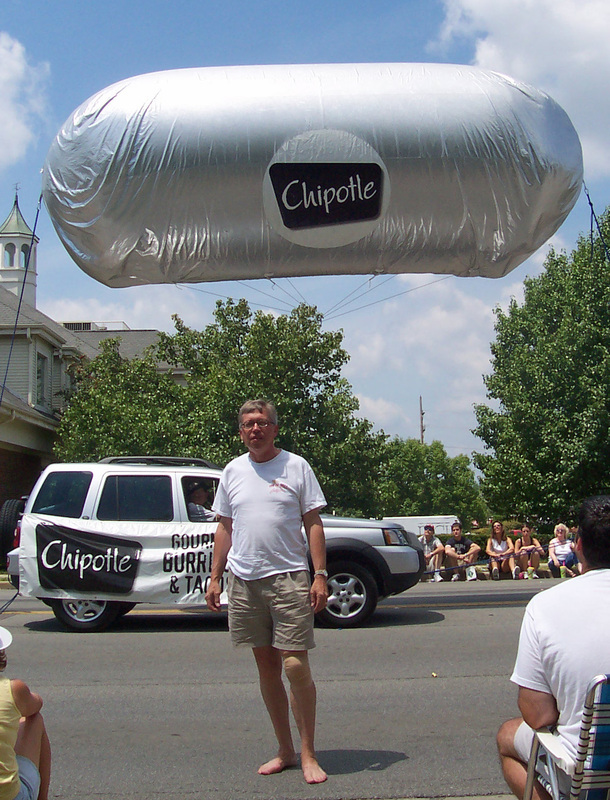 A little later in the parade Julia and I were excited to see this large foil wrapped burrito float going down Rangeline Road. Some of the folks along the curb were wondering why this guy was getting his picture taken. First with the burger, then with the burrito. I was getting hungry by this time.